I love when my clients come in to Hyegraph to pick up their Calligraphy Envelopes for their Weddings or Events. They’re happy and excited to mail their invites out! Sometimes my clients are not in San Francisco and they mail their envelopes to our store, in which case I mail their printed envelopes back to them. 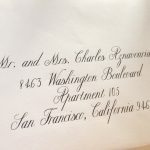 Whether it’s in Napa, Sonoma, Beverly Hills, San Diego or Miami, Texas, Seattle or even in Hawaii, it’s fun to address my clients’ envelopes with beautiful calligraphy from Hyegraph. 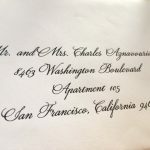 My clients simply mail or drop off their envelopes, pick out their favorite font style from my Calligraphy Page or their own fonts. They pick out an ink color, black, gold, colored or white ink. And they email me their guest list in an excel or word file. That’s it! I can address and return their envelopes within one to two days. The above Beautiful Calligraphy is in black ink, Piranesi Lt BT font style on while envelopes. The ink color can be changed to gold or colored ink. The envelopes can also be in ecru or cream stock. 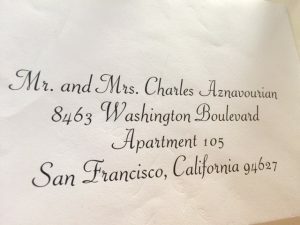 If your envelopes are dark, for example, blue, gold, chocolate or red, you can also choose to address your envelopes in White Ink Calligraphy. Please call or Email me with any inquires or come in to Hyegraph at 3 Embarcadero Center, SF. Please see more calligraphy samples on our Calligraphy Pages. See How To Place Calligraphy Orders for more information. If you need elegant invitations please see our Invitations Page. Please see our Testimonials Page for our happy customers. Thank You for considering Hyegraph for your Calligraphy & Invitations.